Goodness, the weeks since Woolfest have rushed by in a whirl of knitting (yes I caught the stash dash bug), some very exciting secret knitting and a very wonderful trip north. But back to Woolfest. It really is a highlight of the yarny year for me. It’s close enough that I really have no excuse not to go. Moreover, the ladies of the Blackpool Women’s Centre Knitting Group love it too and fundraise to cover the cost of transport, and this year started saving for their entry and spending money in January. We also had some extra spaces left on the mini bus so offered them to local knitting group members and via Ravelry so met some lovely new people too, including Elaine who designs the Woolfest bags that are sold to raise funds for the local Air Ambulance, and Allison who came up from London and joined us in Lancaster. She has a fab post on her blog about her journey, with some great pictures of Woolfest itself. I always mean to take pictures during the day but get too caught up in it all and find it’s time to get the bus back and I haven’t taken a single picture. I particularly love her picture of the Portland Sheep; very distinctive sheep from a very distinctive part of my home county of Dorset. I’m not much of a rule person but I do try to set myself some limitations at Woolfest, otherwise it could be ruinous indeed. This year I had a list of yarns I wanted to check out first hand and I wanted to get some needle felting supplies for a workshop with the Blackpool group. I was also looking for some advice on spinning with a drop spindle – I was concerned my spindle is too heavy for a beginner and I haven’t really got the hang of drafting effectively. I also set out with the intention of ‘no single skeins’ apart from something pink and sparkly for a hat for my niece for Christmas, lets just say that’s not something readily found in my stash. So did I succeed? All the fibres were from Wingham Wool Work, along with the felting needles and the spindle – a lighter one than my existing fancier spindle which I struggle with. I also got advice regarding drafting at the P&M Woolcraft stand from a couple of wheel spinners who were having a go on an E-Spinner. They encouraged me to have a go and talked me through the drafting technique and I stayed and practiced, long enough to hear someone walk by and say ‘I’m not sure agree with that’. I guess E-Spinners are not for the purists, but it certainly helped my drafting and I’ve been having more success with my spindle following the advice and practice. 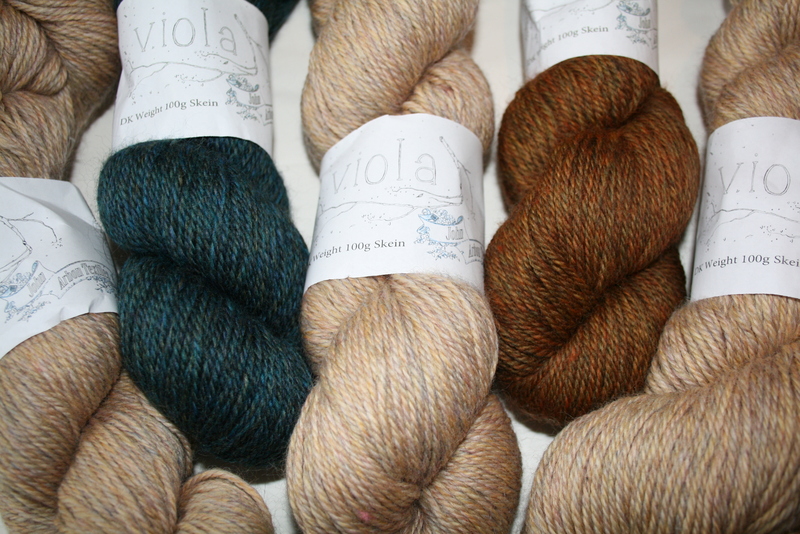 In terms of checking out yarns I was keen to have a look at, and a feel of, John Arbon’s Viola, and having done so, some came home with me. True to my ‘no single skeins rule’ I just had to buy 5. I love the paler ‘Unpredictable’ colour way which combines a subtlety and richness of colour that I found irresistible. But, I’m not sure it’s a colour I could wear close to my face without both the garment and myself looking a bit washed out. So I’m hoping that combining it with the Aquarius and Ginger Nut in a yoked design will work. This is a merino double knit 3 ply yarn which has a lovely lustre – I’m not entirely sure how they manage it, but I certainly appreciate it. 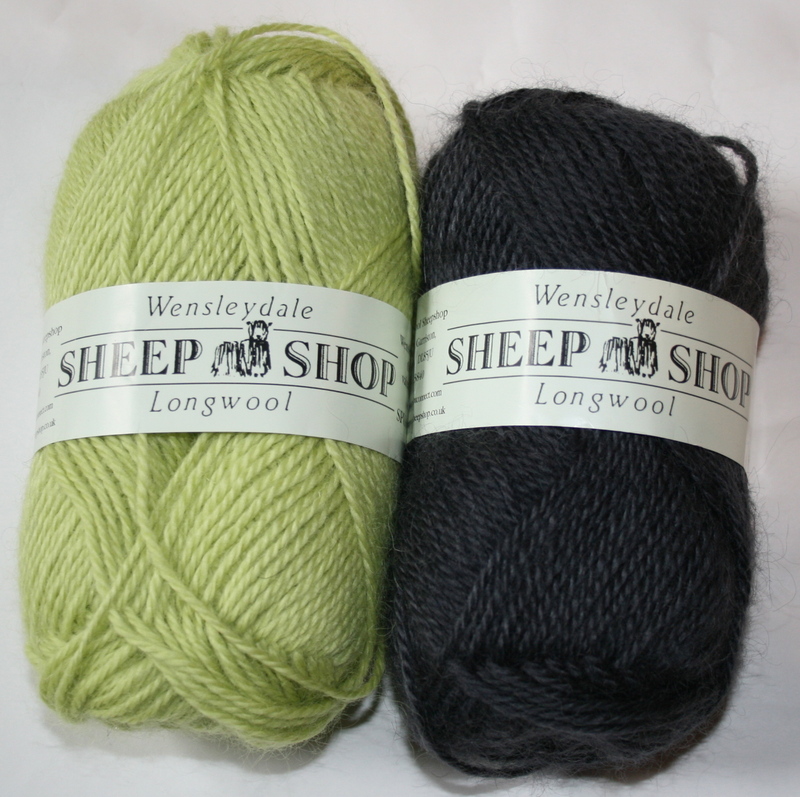 Another yarn I wanted to check out was Wensleydale Longwool Sheepshop. I’d seen this at Harrogate and suspected it would be a good yarn for a sweater for my OH. He has a favourite sweater which is fraying at the cuffs which I’d like to be able to reproduce, before the original (a commercially made garment) is beyond reverse engineering. So I just got a couple balls of DK to show him, let him feel it, and to swatch with. I got two colours that I thought would work well together so I could use them to make a hat or something regardless of whether they turned out to be suitable for the sweater. My choice of yarn was approved and I’ll be getting some more of this in the near future. 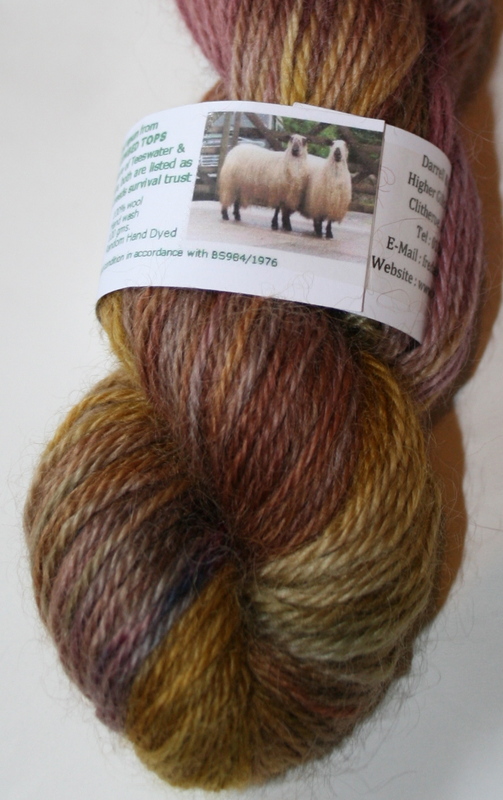 This is another yarn that has a great lustre to it – maybe something of a theme developing here. 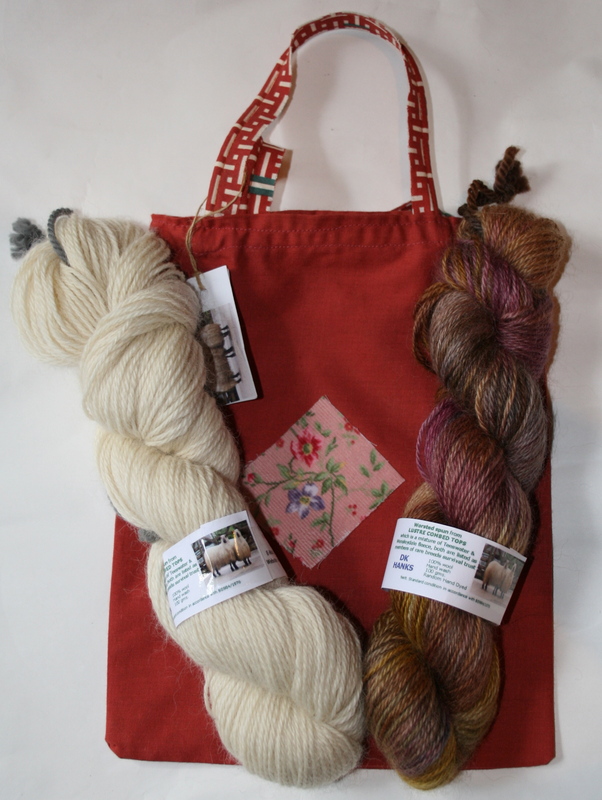 You can buy this directly from the Wensleydale Longwool Sheepshop they don’t have an online shop but if you’re in the UK you can buy it from the source with a quick phone call or couple of emails. If this is a problem it is available online via Baa Ram Ewe. 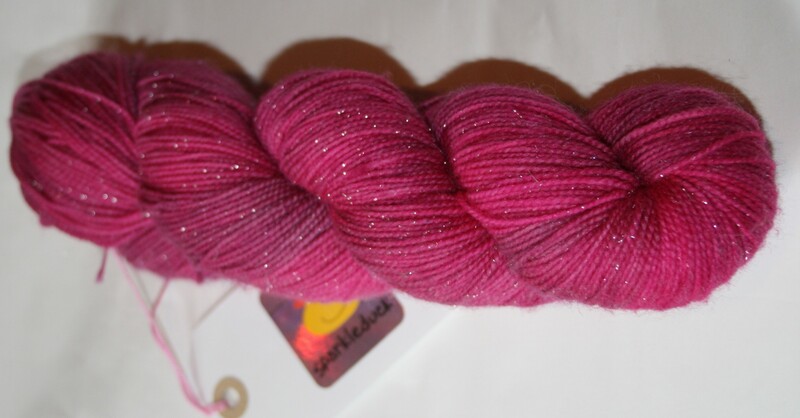 I also got the skein of pink sparkle I was after for my niece’s Christmas present from Sparkleduck. It’s their Galaxy base in Rosebud colour way – it’s pink and a blend of superwash merino, nylon and stellina. It will be knit up in a pattern I’m working on – an excuse to check out alternate crown decreases on a smaller size and make a Christmas present at the same time. The colour has enough variation into the realms of dusky pink to placate me whilst being pink enough for my niece. I checked out a number of other yarns that I’d been curious about and noted them for the future, but didn’t buy any of them and was feeling somewhat virtuous. Of course that’s the point at which I fell from my perch and landed with the softest bump. I was re-charging by admiring the livestock; Woolfest always has a wonderful variety of fibre animals. It was no surprise to me that I was drawn to the Manx Loaghtans of the Lewislox Flock. They are very good looking sheep and those in the stall were bright eyed and appeared curious, and at the risk of being anthropomorphic, I’m quite sure they knew they were being talked about. 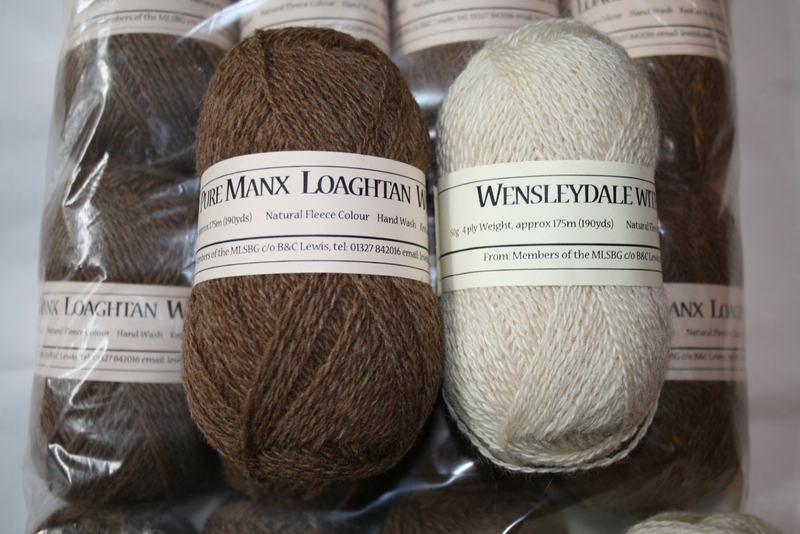 I wavered between the wonderful woven blankets and yarn, and yes, I plumped for yarn – a full pack of 4 ply spun by the Natural Fibre Co. and 3 balls of a cream Wensleydale/manx blend. So, not a purchase I had planned but one I could easily justify as perfect for a sweater and it complied with the no single skein rule. My final yarn purchase saw me stray again from my resolutions but I can’t find an ounce of remorse or guilt within me on this one. Anyway, I didn’t buy a single skein I bought two. 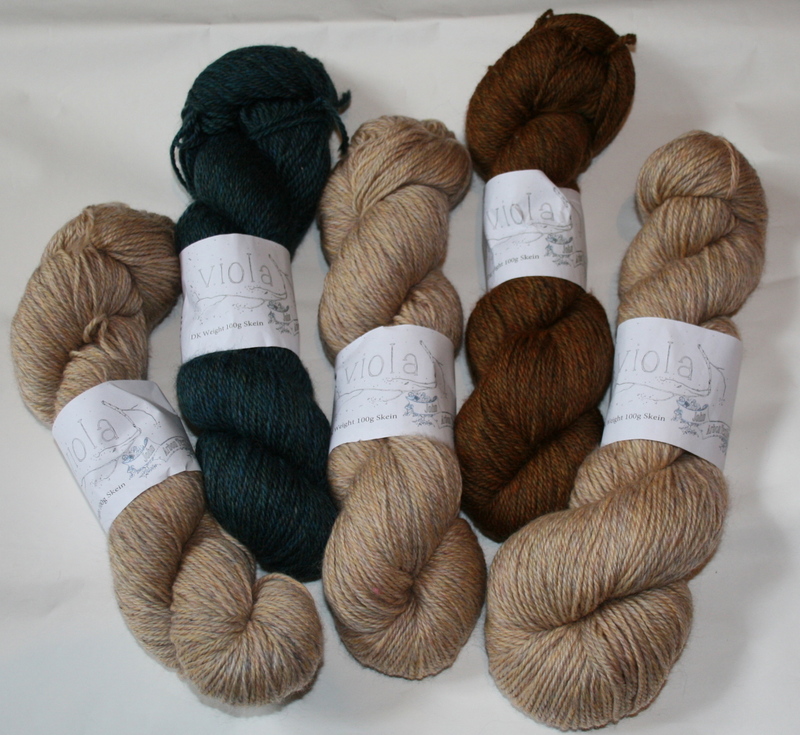 These skeins are worsted spun from lustre combed tops, a mixture of Teeswater and Wensleydale and they certainly retain the lustre. They’re from Teeswater Wools, Higher Gills Farm which is just down the road from me in Clitheroe, and were even closer the other day when I took a wrong turn on my way home from Blackburn… The random dyed skein has such a beautiful range of colours I thought they would be best showcased when matched with a natural undyed skein. And in case you missed that lustre. As my yarn choices may demonstrate and the title of this post attests to, I was rather taken by the gorgeous lustre of our local longwool sheep. They may not be as soft as merino silk blends, but the long smooth staples mean they’re not as harsh as you might think and will have added sturdiness and longevity. Having just spent a week in the Hebrides experiencing the full force of windblown horizontal rain, these latter characteristics seem to match my lifestyle more appropriately. Tess Young, knitwear designer with an interest in the natural and built environments and vintage design. To find out more about me, click on my image. Taking a little time to catch up..